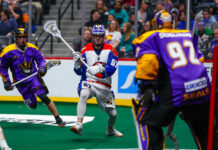 The Colorado Mammoth struggled to get any offensive flow as the New England Black Wolves defeated Colorado 10-6 on ‘Lacrosse Out Cancer’ night at Pepsi Center Saturday. Brad Self got the scoring started for the Mammoth with his first goal of the night, however four goals by the Black Wolves, with the final one scored with .5 seconds left in the first quarter put the Mammoth on their back heels. Self continued his fabulous night offensively, scoring again in the second quarter, beating Black Wolves goalie Aaron Bold on a back-handed goal that impressed the fans. The Black Wolves were powered by a third goal from Kevin Crowley, completing his first-half hat trick. Crowley would finish as the No. 1 star of the game with five goals and an assist. As the halftime horn buzzed, Colorado trailed New England 6-3, but may be the most important part of the night, the Mammoth included fans in a special ceremony at halftime for pediatric patients, their families and their caregivers at Rocky Mountain Hospital for Children. The ceremony will include a video about the bond Mammoth players and kids at Rocky Mountain Hospital for Children have formed through hospital visits and special events throughout the last month. 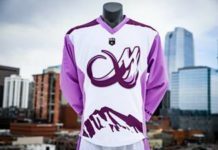 Through Lacrosse Out Cancer night presented by Rocky Mountain Hospital for Children, the Mammoth raises funds for local cancer related charities through ticket sales and silent auctions. A portion of the proceeds from every ticket sold for Lacrosse Out Cancer goes toward local cancer related charities and kids from the hospitals designed the helmets the players wore in the game. Along with raising funds, the Mammoth works to raise awareness about the trials and triumphs kids face along with cancer treatment through personalizing Lacrosse Out Cancer night. On Saturday, the Mammoth’s helmets will be personalized with artwork drawn by pediatric patients at Rocky Mountain Hospital for Children. The roster cards and “Get in the Box” signs that are given to every fan at Pepsi Center are also personalized with children’s artwork. As the second half started, the Black Wolves were penalized twice – setting up a five on three opportunity for over a minute. After New England killed the first penalty, the Mammoth continued on a five on four man advantage for another three minutes after David Brock’s illegal cross check major sat him in the box for five minutes. The Black Wolves defense stood strong, embracing the Mammoth push and holding Colorado scoreless during the power play. However with 4:58 left in the third quarter, Joey Cupido break through with a goal, opening up the scoring for the Mammoth, who also got a goal from Jacob Ruest to cut the Black Wolves lead to two. However two quick goals from the Black Wolves pushed their lead 9-5 at the end of the third quarter. The Mammoth attempted to engineer a comeback as Noble found the back of the net for his first goal of the game. Noble would finish with one goal and two assists on the night. The Black Wolves were just too stiff in goal, as Aaron Bold — the second star of the game — made 36 saves on 42 shots and the Mammoth couldn’t get shots past him. Crowley would score his fifth goal of the game with 39 seconds to seal the win for the Black Wolves. Dillon Ward started in net for the Mammoth finishing with 39 saves including a penalty shot in the fourth quarter. 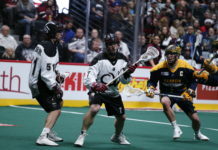 This was the second-to-last game for the Colorado Mammoth in the regular season and they will host the Toronto Rock in the season finale on Saturday, April 28th. The Mammoth have already clinched a spot in the NLL playoffs and are locked-in as the No. 2 seed in the Western Division, preparing to play Calgary once the season comes to a close.